This holiday combines the cultural highlights of Ethiopia's Northern Circuit wit the wilderness and raw beauty of the Bale Mountains National Park. A unique opportunity to visit rock hewn churches, lake side monasteries and then view rare wildlife from the comfort of a remote mountain lodge. 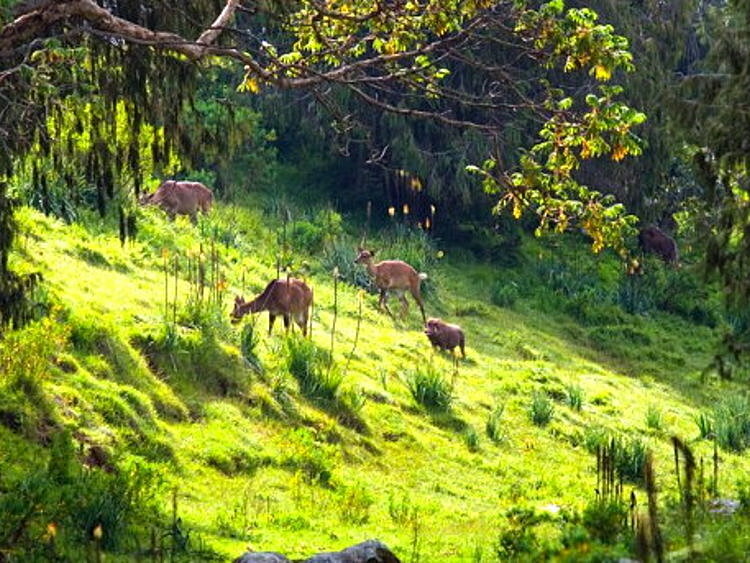 On this diverse itinerary we have included our highlights of the Northern Historical Circuit including the Island Monasteries of Lake Tana, Gondar's Royal Enclosure and the magnificent rock hewn churches of Lalibela. If you have time, then we add the stellae at Axum (additional 1-2 days, although note accommodation options here are poor) and the incredibly remote and hard to reach monasteries of the Tigray region (additional 3 days, only suitable for those with a good head for heights). Lake Tana is an excellent place to start your cultural tour of Ethiopia, with over 20 monasteries dotted along the shores and on the islands. You visit these by boat, which also takes you to see th source of the Blue Nile. 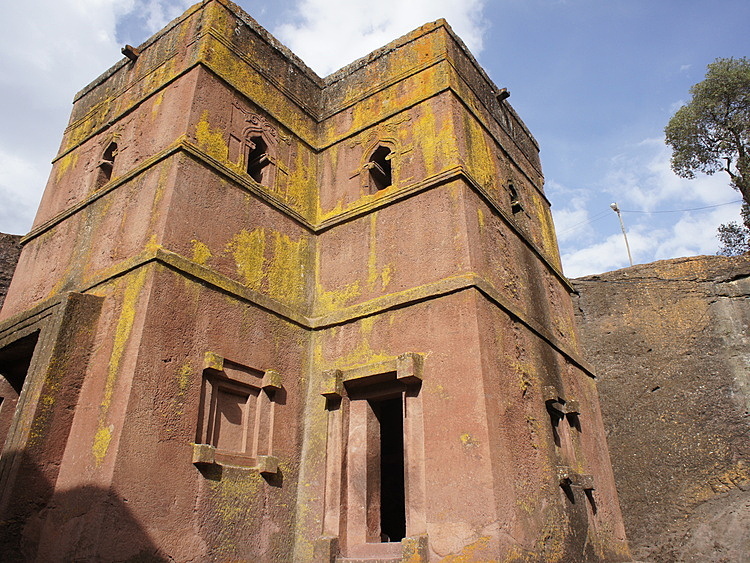 You then continue to Gondar, where you get to grips with the history of Ethiopia with a tour of the medieval sights. An undoubted highlight of Northern Ethiopia are the eleven rock hewn churches of Lalibela. all carved out of the bare rock and concentrated within walking distance of the town. This is an incredibly atmospheric location where white-robed priest are often found enjoying the morning sun whilst chanting the Eucharistic Prayer and contemplating scriptures. From Lalilbela, you head to the Bale Mountains National Park, a lesser visited location. 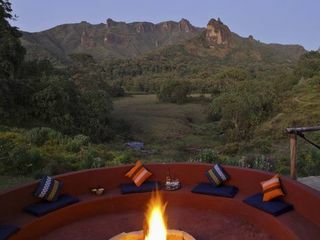 This makes a perfect extension to the classic northern historical circuit and the focus on wilderness and nature is a good contrast to the cultural. 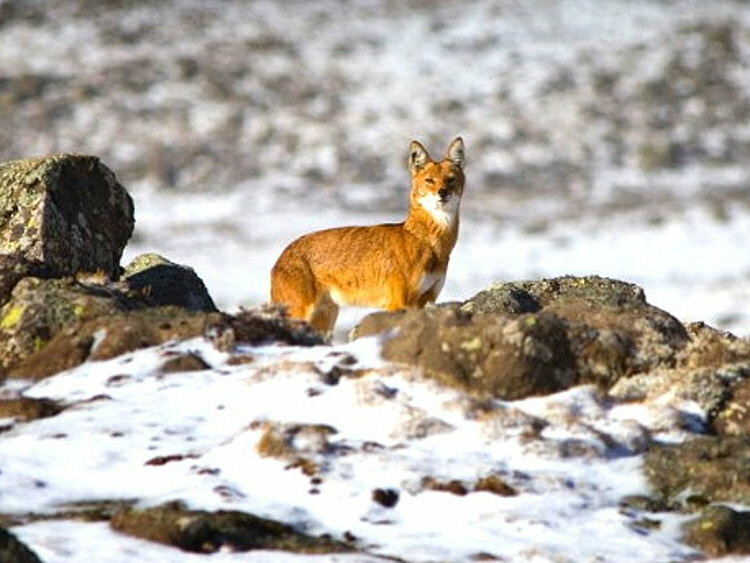 The newly opened Bale Mountain Lodge offers comfortable, accessible accommodation in a beautiful location giving you the comfort to explore the unique surrounds and excellent chance of seeing Ethiopian wolf and the array of endemic birdlife. This is a pristine wilderness that incorporates the largest tract of Afro-alpine moorland remaining on the continent and a stunning cloud forest with significant numbers of endemic and rare bird species. 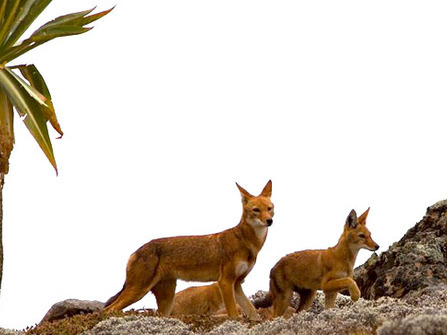 The itinerary includes internal flights with Ethiopian Airlines and specialist local guides in each location. This keeps the overall cost down and saves on some long and arduous journeys. If preferred we can quote to include an accompanying tour leader for the whole trip and / or overland travel by 4wd instead of internal flights. You will be met at the airport and transferred to your central hotel. After a rest and refresh at the hotel, your guide will take you around the highlights of Addis. Depending on time and how you feel after your flight, you can choose to sample some of the best coffee in the world in the Piazza (old town), explore the National Museum and Archaeological Museum (home to the 3.5 million year old remains of Lucy) or explore the largest open air market in Africa. After a morning flight and checking into your accommodation, you will have the afternoon to visit the Blue Nile Falls (40 minutes from Bahir Dar). Although the power of the falls has been subdued by the hydro electric plant, they are still an incredible sight. 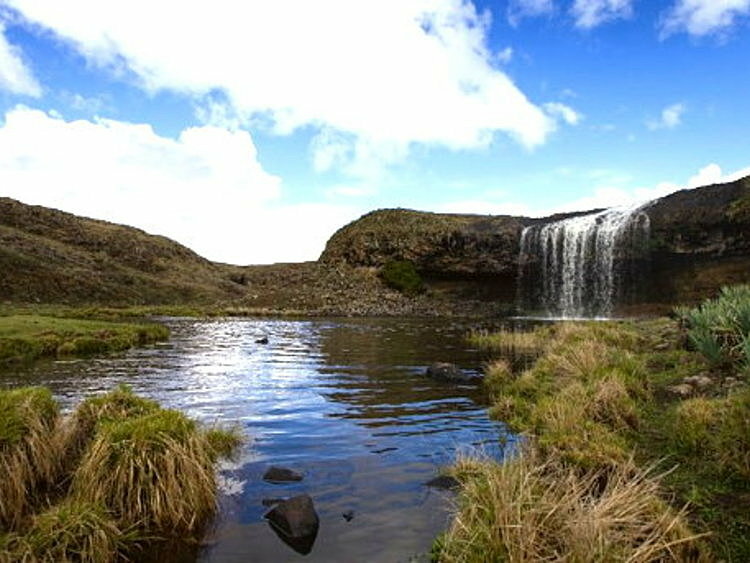 A lovely circular walk takes you over an ancient bridge built by the Portuguese in the 15th century, passing fantastic viewpoints of the falls, over a rope bridge and then up to top of the falls where you will cross by boat to meet your vehicle. After breakfast you will go for an early morning boat excursion on Lake Tana, the highest and largest lake in Ethiopia and also the source of the Blue Nile. Dotted on its shores and islands are 20 monasteries, most of which were hidden to the outside world until the 1930's. 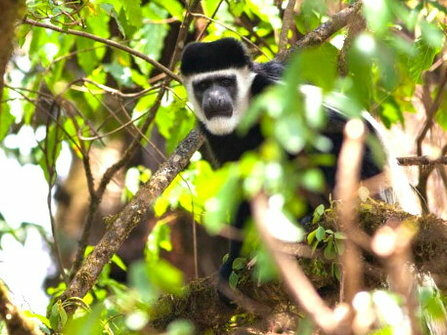 You will visit two examples of monasteries before ending your excursion by passing by the mouth of the Blue Nile. After enjoying a relaxing lunch on the shore, transfer to Gondar. Today your guide will take you to explore the fascinating medieval history of Gondar. Your tour will include visiting the Royal Enclosure set in its beautiful gardens, Fasilidas Bath and the fascinating Debre Berhan Selassie Church, renowned for its vivid and striking interior art and arguably one of the finest church interiors in the country. Today is an early start for your morning transfer to Gondar airport. Once you have landed, you will be picked up at Lalibela Airport and transferred to your central hotel. 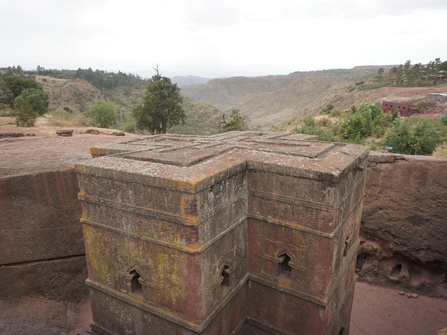 Lalibela is world famous for its monolithic rock hewn churches. Carved by hand out of solid rock in the 12th and 13th Centuries and filled with the evocative sound of chanting of monks, this is a deeply spiritual place and quite rightly a UNESCO World Heritage site. You will visit most of the Central churches that Lalibela is so famous for including the Northern Group (containing the Lalibela Cross), The Western Group (Bete Giyorgis) and the Eastern Group. Today is an opportunity to take it a little slower. you can choose to walk or ride a rented mule (small extra cost for the mule) up to Asheton Maryam Church, situated at about 3100 metres. 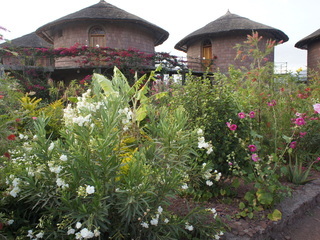 Here you will be rewarded with spectacular views of Lalibela town and the surrounding valleys. Transport (where relevant): Transfer to Lalibela Airport and Goba Airport. Your guide and vehicle will take you up to the Sanetti Plateau which is 4000 metres above sea level with an excellent chance of seeing the rare Ethiopian Wolf and spectacular bird life this area is renowned for. Transport (where relevant): Tour of Sanetti Plateau. 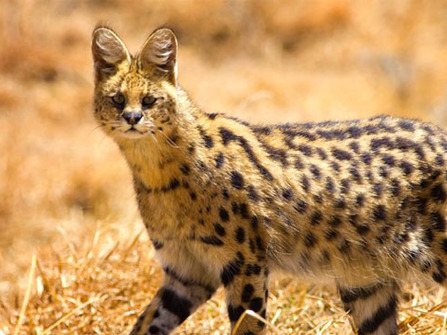 The guide and vehicle are at your disposal should you wish to return to the Sanetti Plateau or journey outside of the park to the central Rift Valley in search of rare indigenous birds, visit the Sof Omar Caves the largest limestone caves in Eastern Africa or the ancient walled city of Harar one of the most holy Muslim cities in the world. However, if you prefer to explore on two feet, the lodge has a number of marked tracks which guide guests into the forest, out to a hot spring or up onto the plateau. Morning at leisure at Bishangari. Although there are several national parks in the area, we recommend enjoying the peace and wildlife found at the lodge on the shores of the lake. 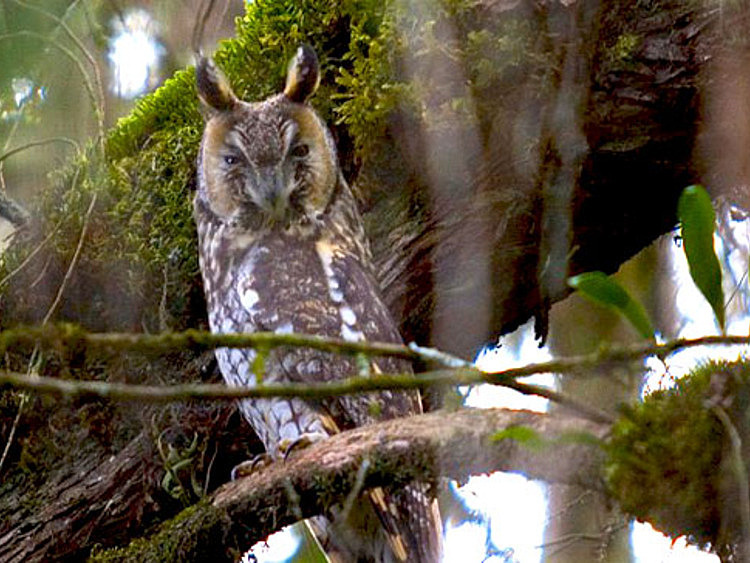 We recommend a half day wildlife walk in the morning to view the large array of endemic birdlife. Afternoon transfer back to Addis Ababa. Excludes: International flights, airport taxes, additional meals & activities, visas, tips, medical vaccinations, comprehensive travel insurance and incidental expenses are not included. The Ethiopian Tourist Board proudly promotes their slogan “13 months of sunshine” to anyone who will listen, but they are not far off the mark. The rainy season in the North is in July and August, it won’t really affect you if you are planning on touring the Northern Historical route. The best time to visit the North is in autumn, after the rains when the mountains are full of lush green and the views are unimpeded by haze.